As the 1990s began, the Japanese ready-to-run R/C toy company Taiyo sought to maintain the success of it’s buggies and trucks of the mid-late 1980s by releasing a series of increasingly unconventional R/C vehicles that were focused less on backyard racing and more on pure recreation. The R/C market was pretty saturated at this time, and some other significant manufacturers had even withdrawn from R/C (such as Marui) or sadly closed their doors entirely (such as AYK, Shinsei and Yonezawa). To compound the problem, the market for home video game systems appeared to be growing stronger each year, and it seemed as though kids were increasingly drawn toward digital entertainment, which inevitably meant less time for playing outdoors. 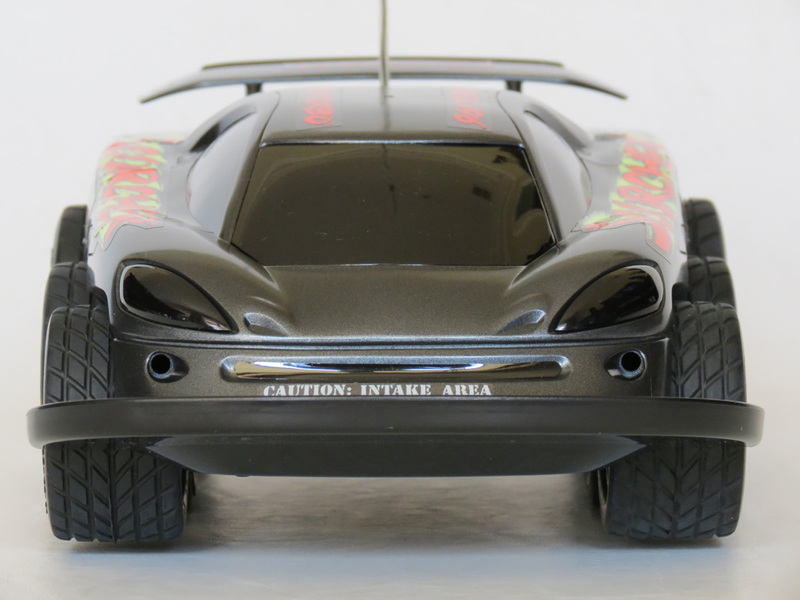 But despite this, Taiyo’s effort to release more unusual and unique R/C vehicles was continuing to pay dividends in the ready-to-run market, even when some of their competitors were seeing the market decline. 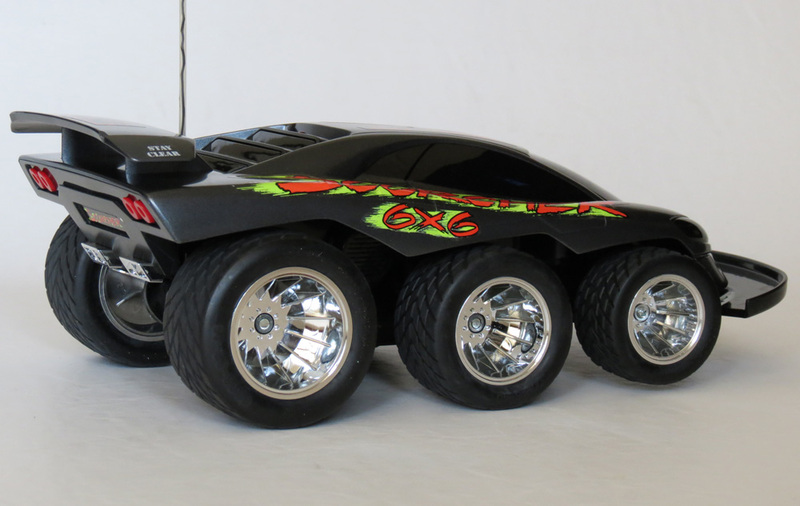 In 1990, Taiyo’s high-speed tracked vehicle the Fast Traxx had been a huge hit. And in 1992 they were looking for another new concept that would combine speed and stunt action, but in a fresh package. The result was the Taiyo Cyclone – a vehicle with 6 wheels and similar futuristic looks as the Fast Traxx, that would hit high speeds on most terrain and also perform crazy 360° spins (hence the name “Cyclone”). Taiyo themselves referred to it as an “ingenious product”, and their confidence was to be justified. 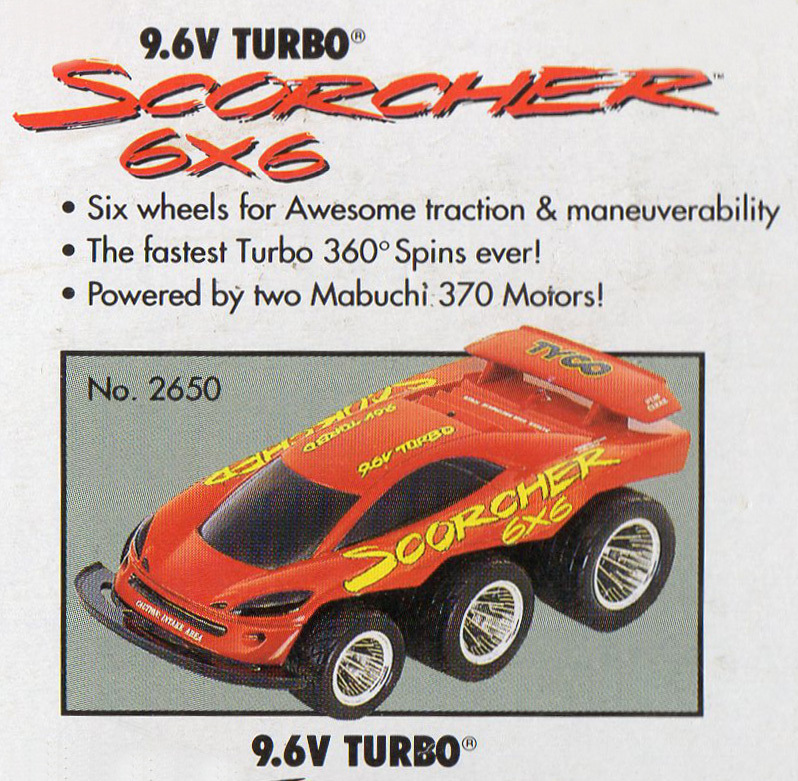 In 1993, Tyco added this vehicle to their line of Tyco/Taiyo branded releases in the USA, and they renamed it the “Scorcher 6×6”. 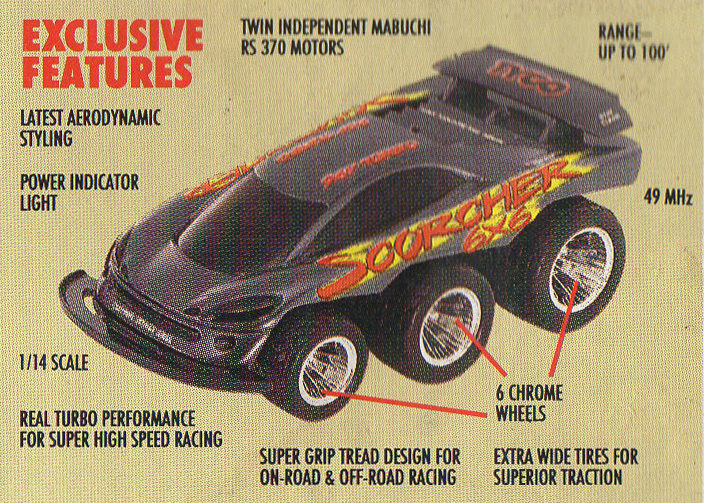 It went on to become one of Taiyo’s most successful R/C vehicles. 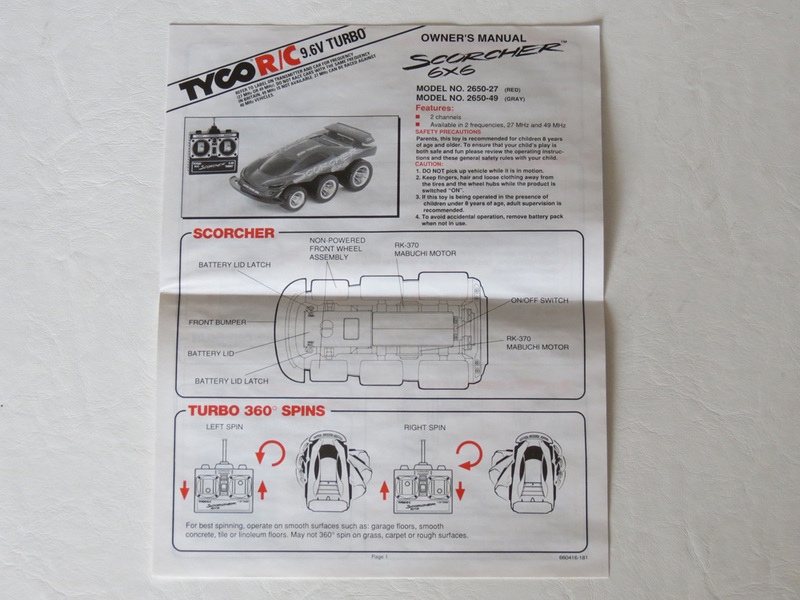 Featured further down on this page is a brand new in box Tyco/Taiyo Scorcher 6×6. 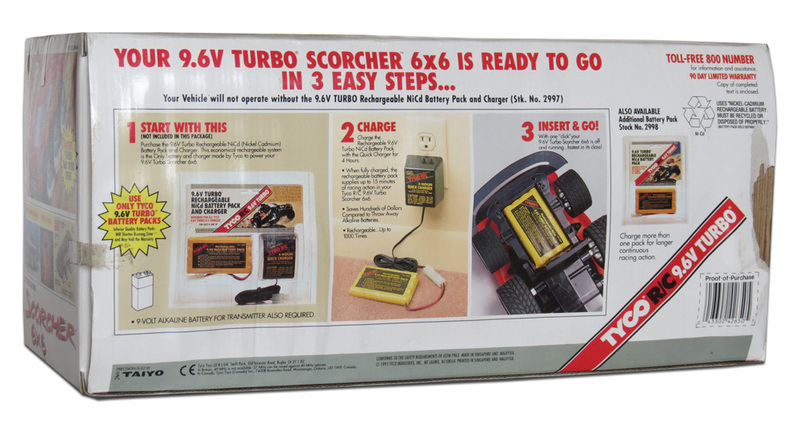 My first experience with the Scorcher came around Christmas in 1993, when a friend stayed with my family for a couple of weeks while his father was house-hunting. 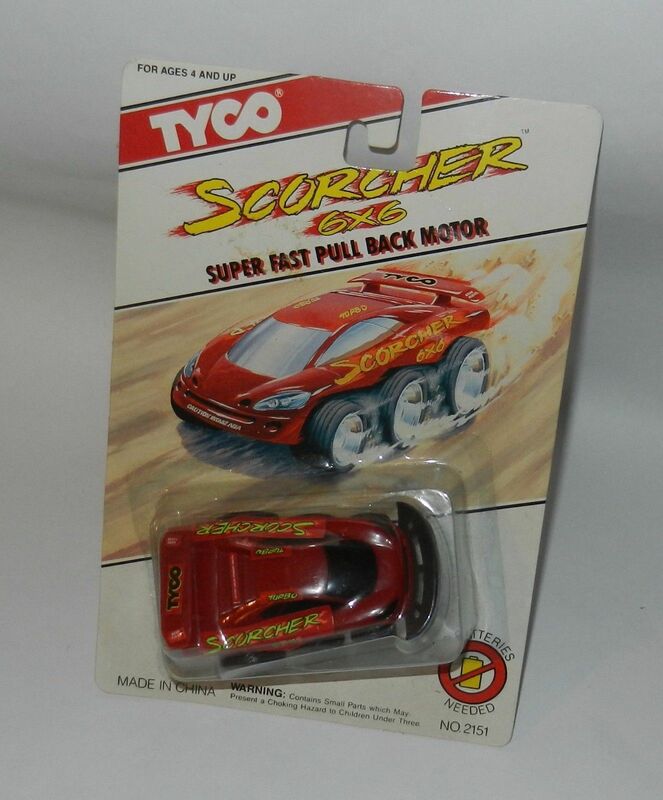 He brought his brand new Scorcher with (branded the “Metro/Taiyo Scorcher 6×6” here in Australia but otherwise identical to the “Tyco/Taiyo” release), and we spent a few weeks that summer overnight-charging our R/C toys and usually running them each day. Well I’ve not exactly done an analysis of which R/C cars can spin around on the spot the fastest. But I can’t imagine anything doing it faster that the Cyclone/Scorcher. 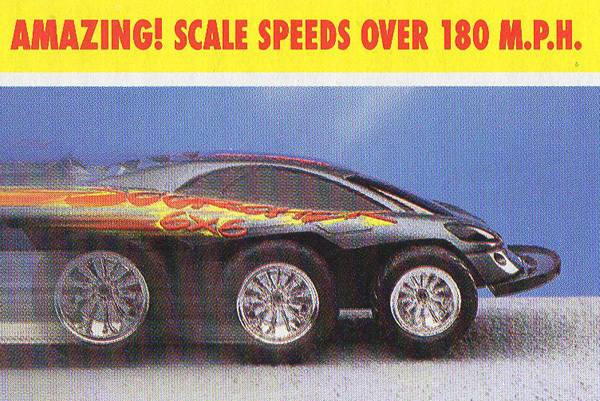 And in many ways this car was pretty much like the Warner Bros ‘Tassie Devil’ of the R/C toy world. The vehicle sure looked impressive, and I loved the low, aggressive stance and generally high quality construction – typical of the robust Japanese-made vehicles that Taiyo had become famous for over the years. I can also remember that my friend was pretty crazy about this car too, and was very keen for us to race it against my Tamiya Hornet. He didn’t think the Scorcher would be as fast, but apparently this thing had a pretty decent turn of speed nonetheless. Taiyo’s claimed top speed was 21Km/h. I must admit though, that as a kid of the 1980s (when car toys had tended to be more conventional and realistic) I was actually a little unsure about some of these crazy action vehicles that Taiyo were producing in the early 1990s. For me, the most fun you could have mucking about with your R/C cars was to create a little dirt track for them, and then race them. Properly. You know, along straights, through hairpins, and down sweeping curves. I had no interest in competitive club racing. But I liked having my own track somewhere on my parents acreage, and then having my friends come over and bring their cars for a bit of summertime afternoon racing. Nothing serious, and a lot of fun. However, vehicles that could do crazy stuff were usually a complete handful to drive in the direction you wanted them to go in. But thanks to my friend’s Scorcher, I soon realized that you just needed to set your expectations a little differently. 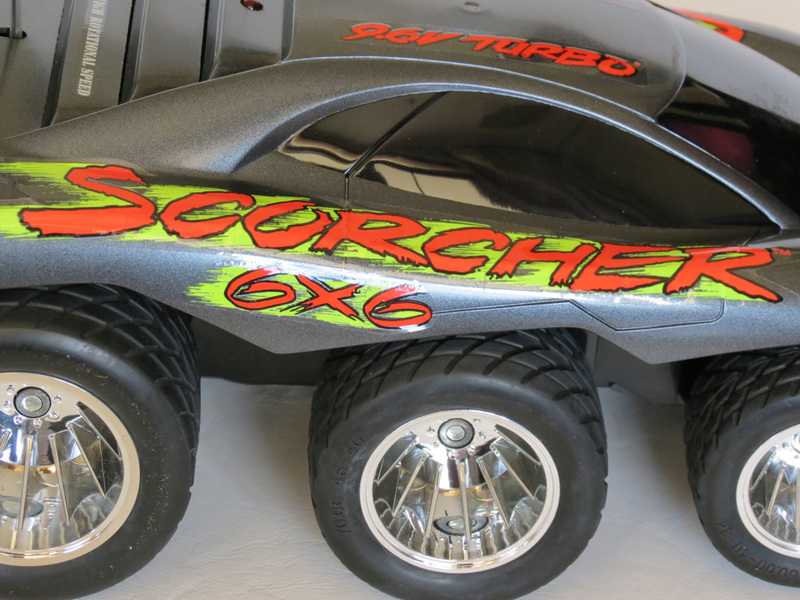 And if you liked mucking about with R/C cars for the fun factor alone, then you couldn’t help but be entertained by something like the Scorcher 6×6. To sum it up, the Scorcher 6×6 was a vehicle with a two-stick transmitter that (much like the Fast Traxx) featured twin forward/reverse levers and nothing else for you to actually steer with. Each lever controlled the wheel spin of one or the other side of the car, with each side driven by a separate motor. In fact, they were two Mabuchi 370 motors – similar to the single motor found in a hobby grade buggy like the original Tamiya Grasshopper. Except here, you had two. So needless to say, this made the Scorcher a blast to drive. This is great fun when you’re a kid, because you tend to take it all quite seriously. 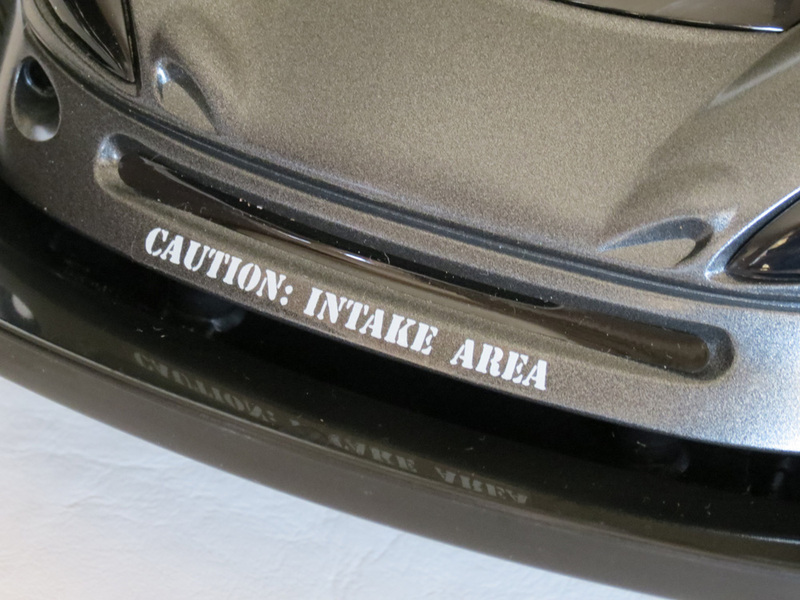 And it’s these little touches that also give a toy it’s personality. 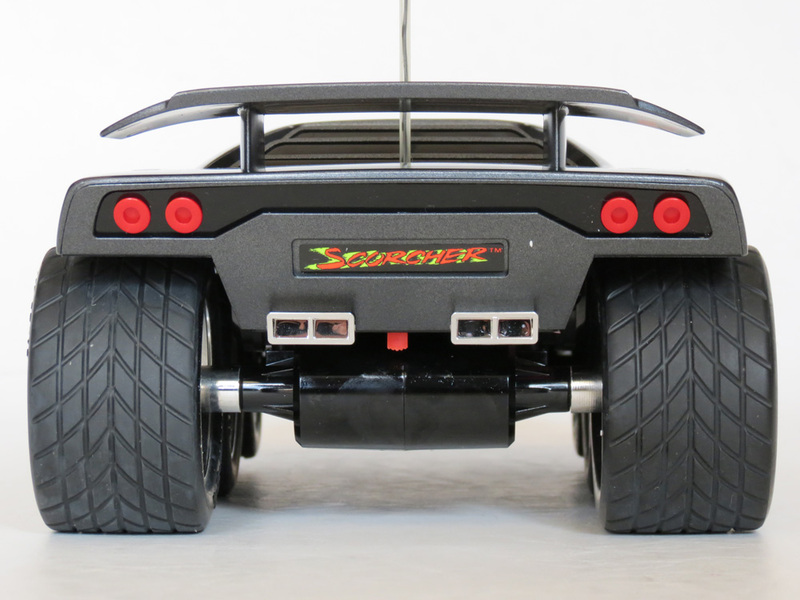 As you can imagine, with two forward/reverse levers on the transmitter, driving the Scorcher 6×6 around any normal “corner” was always going to be a challenge. The best you could do for cornering was to ease off one side’s acceleration, and then continually “tap” that lever to try to maintain a reasonably steady corner angle, otherwise the car would quickly tighten its turn into a complete on-the-spot spin. But spinning was of course, part of the appeal. Try as you might, keeping a Scorcher within the confines of a racing track was near impossible. Eventually you’d just want to let the thing loose – point it in a particular direction, slam both accelerators forward, and let it rip away into the distance. Then stop and spin up a crazy cloud of dust. This was actually particularly effective as a dog-defense mechanism – any dog chasing the car would be unable to grab it once it went into one of it’s cyclonic spins! But all this fun would have meant a lot less, had the car not had such satisfying and robust looks: big wheels, a sleek body with spoiler, and an aggressive stance. One funny aspect of the Scorcher 6×6 is that, despite it’s looks and what the name implies, this is not actually a six-wheel-drive vehicle. It’s really a 4WD. The car undoubtedly caught people’s attention thanks to those six wheels, but the two front wheels are just free spinners – they don’t actually do anything. In fact, when the car is sitting still, you can even see that those wheels are sitting a few millimetres above the ground. What they do offer is some guidance at the front whenever its weight is thrown forward (such as under braking), but that’s about all. As to the reason why Taiyo opted not to make the car a true 6WD vehicle. Well I’m not sure, but I suspect it was simply considered an unnecessary manufacturing expense. After all, the car ended up being a huge hit anyway, and there is little about its behaviour that would have changed or improved had those small front wheels been operable. So it all boils down to clever marketing and a successful concept, even if it did seem a little disingenuous. 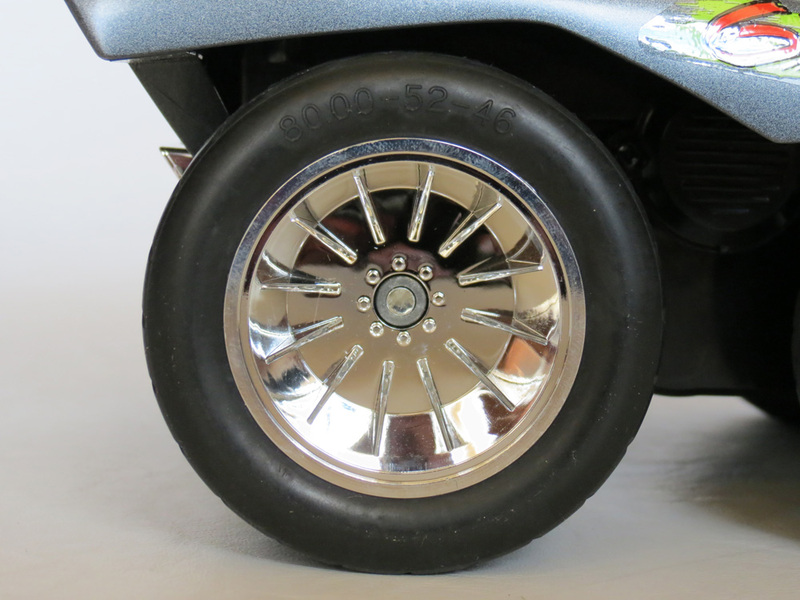 Those 6 wheels each come with quality rubber tyres (the kind you rarely see on R/C toys these days), with semi-pneumatic support. They don’t exactly have “off-road” tread though, making the Scorcher quite susceptible to becoming bogged in soft sand. But the tyres are a compromise between and on and off-road performance – smooth enough to last forever if you’re racing it on paved surfaces, but still with enough grip to keep the car scrambling over hard-packed dirt as well. As with every Taiyo release beyond the mid-1980s, this model is not Digital Proportional – with Taiyo preferring to keep things simple and robust with direct, one-speed acceleration. Interestingly, the car doesn’t even have a gear switch to change gears – again, it’s a straightforward case of blasting this vehicle at top speed every time. By 1992 Taiyo had also opted to drop the option of running via AA battery cells, as it was becoming more lucrative to make customers purchase proprietary Taiyo (or Tyco) 9.6v battery packs (which are simply 8xAA rechargeable battery cells wrapped in a pack, with a special plug attached). 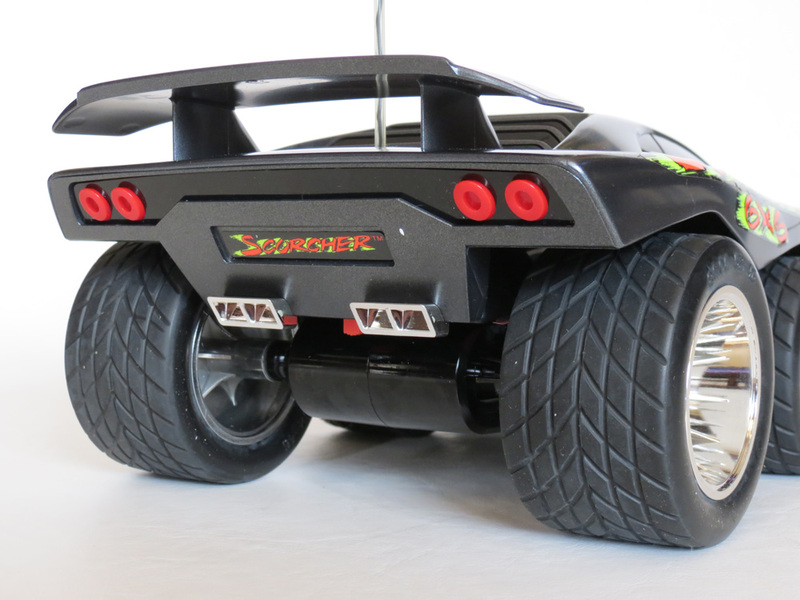 So the Cyclone/Scorcher has no individual AA battery tray – you just snap in your official battery pack, and go. But there’s no denying that the move to battery packs also brought with it some convenience. And forcing people to use plugged-in Ni-Cd packs like this also meant there was less risk of cars being left for months with leaking Alkaline cells sitting in their battery compartments – a plague that still affects me almost every week, as a collector of old vintage R/C toys. During that summer of 1993/1994 in Australia, I can remember my friend and I racing the Scorcher against my Tamiya Hornet on quite a few occasions. But due to the Scorcher’s tendency to veer and pretty much go where it wanted on an off-road track, it was hard to square them off directly against one another. Nevertheless, when both cars were roaring along my dirt track in a straight line, I’d have to say it was tough to pick a winner – the Scorcher seemed able to keep up with the Hornet. And as anyone who’s owned a Hornet will know, that buggy is no slouch either, with a very simple and effective gearbox and a 540 motor. One of these days I’ll have to speed-test them together in a more controlled environment. As I mentioned before, if you’re taking a Scorcher off-road it will perform better on hard packed dirt, rather than anything too soft where it can get itself bogged. But it will bounce around too, due to the fact that it lacks any sort of suspension. This car really is a straightforward, high-speed vehicle designed to entertain. But it’s still amazingly tough at the same time, and despite the hard knocks it takes over bumpy ground, the car has a tendency to survive and just keep going. 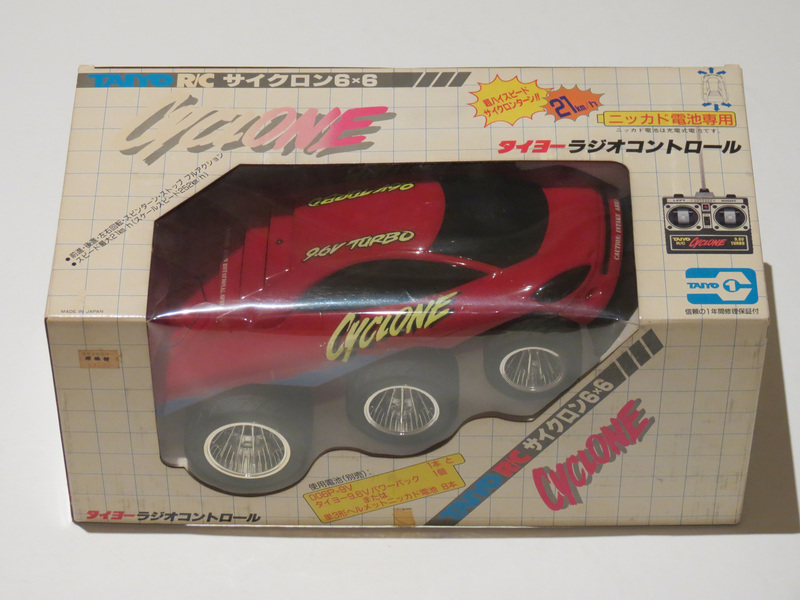 Today whether you’re looking for an original Taiyo Cyclone or the Tyco “Scorcher 6×6” release, you can expect to pay up to a few hundred US dollars for one in mint condition. This car would have to be considered one of the more collectible Taiyo/Tyco releases during their boom years of the mid 1980s to the mid 1990s, thanks to it being both popular and unique for its time. Finding a mint one is of course, extremely difficult, as being ready-to-run they were all too easy to take out of the box and play with. 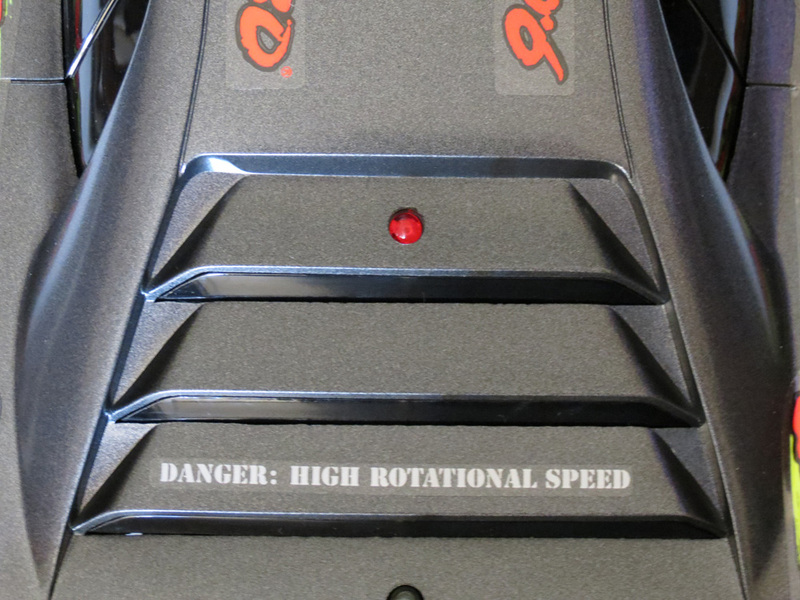 But if you can get your hands on a good one, you’re sure to enjoy the crazy spins and top speed of this entertaining, classic beast of the early 1990s. 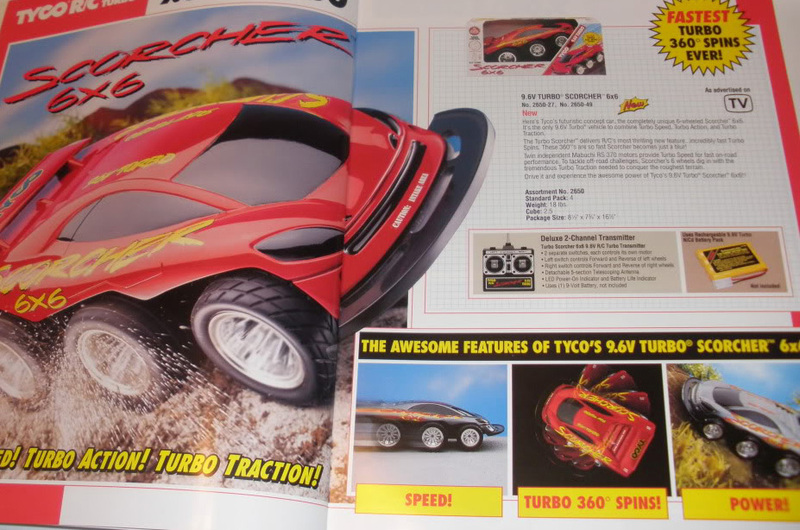 And it’s a reminder yet again, of the creative R/C toys Taiyo was responsible for during their heyday. From the beautiful scale buggies of the late 1980s, to the wild concept toys of the early 1990s, all were high quality items that we will never see again. So collect and enjoy them while you still can. Batteries: 1 x 9.6volt Battery Pack (Car). 1 x 9volt (Transmitter). this was a lot of fun back in the days, great range and speed, the best r/c car ever!! If you’ve ever driven a Mutator with the wheelbase at full extension the spins are slow and it almost binds up. With the wheel base “in” it’s more agile. If the Scorcher was 6wd I think it would do slow binding spins, plus that’s why the front wheels don’t touch the ground. They set the four drive wheels close for fast spins, but the car would be stocky with four wheels, so they gave it two extra wheels to even it out aesthetically. I had a similar Tronico vehicle… today I only have the remote left from it. it main feature was a set of flipping middle wheels… I can’t recall the company or the name of the product, but it was a similar six wheeler, with a spoiler on the back and the extentable frames for “stair crawling”. would you happen to know what’s the producers name? Being Tronico, yours would have been manufactured by Nikko (Nikko toys were rebranded “Tronico” but often still had “Nikko” somewhere on the box, in European markets). So do some searches under Nikko as well, and you should turn something up. I’ve just dug one of these out of the shed (the red ‘Metro Scorcher’). I need to find a couple of the plugs that come on the original battery pack. I can find standard 2-way Molex easily enough but, they won’t go into the socket within the car itself. At least, not without reaming / reshaping the hole. Oh well, if all else fails, I can gut the drive, gear it down and, build a tank body for it. I grew up with these and I remember every time I was playing I was cleaning all the parts and park it next to my car.First thing in the morning was to take a look and charge the batteries so I will go to a closed supermarket parking to play.I remember that I did some mod by adding extra battery and I burned the motors and after that I bought new one.I remember to do drift on this on wet road. Unfortunately I don’t remember where I have it and If I have it but I am watching in in ebay and If I will see any of those like new and never used I would give even 300$ to have it . We had a clean out of the shed and found 2 of them. Pluged the batteries in, chucked them in and away they went. Good times! Not only were they tough, they are getting tough to find unopened in box. This car was my childhood favorite toy. It has been a good couple years since I’ve seen a sealed one pop up on ebay. I look for North American NIBs of this car at minimum once a week. The last one I saw 2 year ago (27MHz Red 9.6V sold for a best offer) He was asking ~300USD w/ a battery pack, I own it, the box is mint tape intact no UV damage stored in a Styrofoam capsule w/ desiccant. I will never open it and will also never sell it. One day I hope to own the 49MHz version. Awesome article about an equally awesome mass production RC! Cheers Tim! 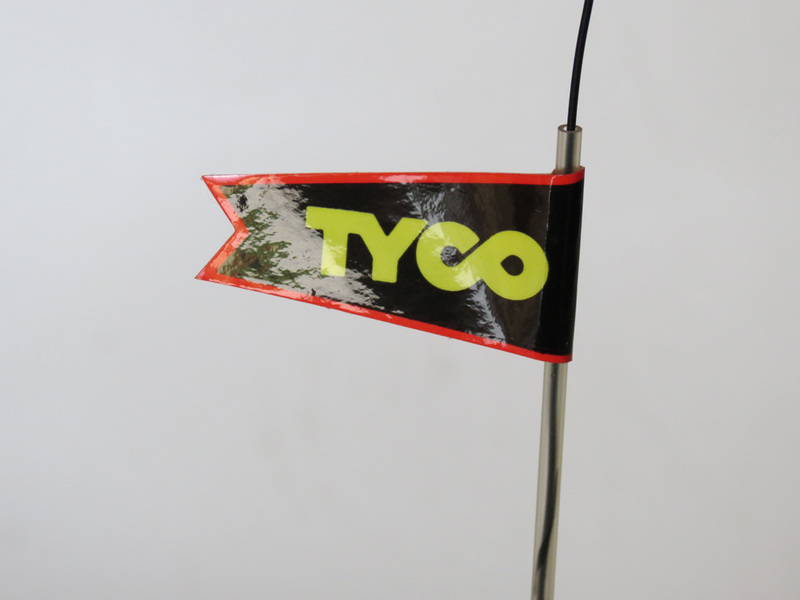 Yes, NIB Tyco branded examples are pretty hard to find, and I think the same goes for most of the early Tyco R/C models (say roughly 1986-1992). You were very lucky to get that one. Mine (as shown on page) was actually sourced from another collector in Australia (though it originally came from the USA of course). I’ve also been contacted by a few people looking for them in the past year. This is the thing about ready-to-run vintage R/C models… they were all too easy to take out of the package and run back in the day (unlike kit models), that even fewer are now left in NIB condition, when compared to things like Tamiya R/C kits. 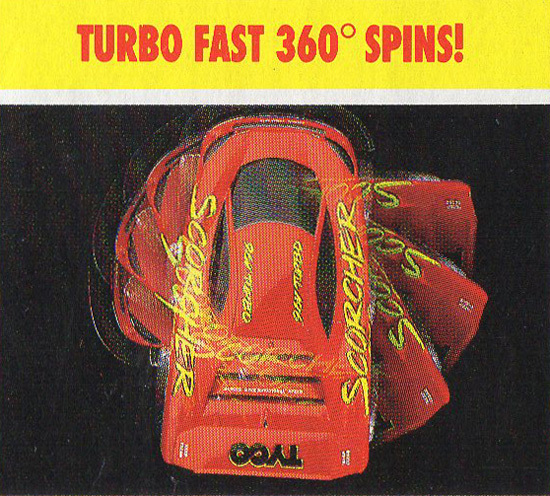 hi all i have 1 of these Scorchers still in great condition with control but no box or charger so cant test if still works.it was a great toy back then kids would love it. Hi, my brothers and I each still have our Scorchers from when we were kids. Pulled them out of the cupboard recently and all still working well. The only thing was we were quickly reminded how little time the batteries lasted for vs the charge time. I was wondering if there was any guidance on what type replacement batteries might be out there to give a longer drive time nowadays that would suit this car – oh, and where I’d get them? 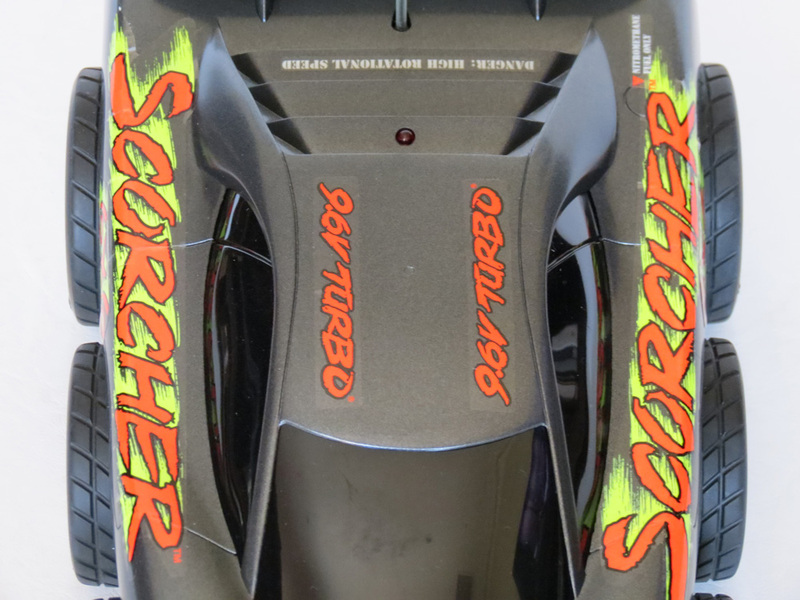 I’d like to get my child an RC car but the ones I’ve seen in stores and even online look cheap and uninspiring compared to my old scorcher (which unfortunately no longer has the antenna). 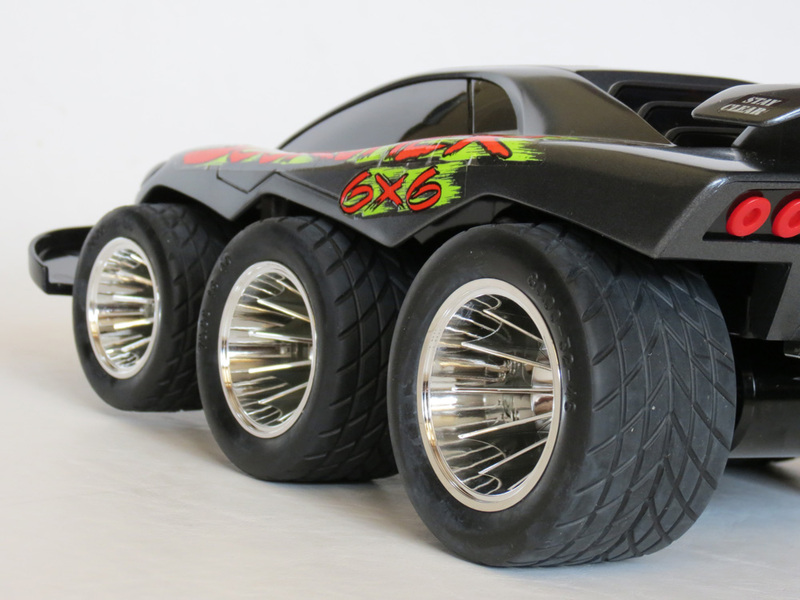 Are you able to offer any recommendations on similar RC models these days or do they simply not exist, which you point to in your reference to the quality of the tyres. Thanks for your question Stuart. There is unfortunately, a lot of rubbish on the market these days, all made in China. A lot of it unbranded, or branded with names that will disappear next week. 80s Greats like Taiyo are now gone. While Nikko has become mostly rubbish. Most other 80s brands have disappeared altogether. The “hobby” type R/C cars still offer some good quality examples though, and the low-end of that range is where you should look to find something close to what the high-ends ready to run toys used to be. Because where once it used to be possible to buy great quality ready to run RC toys from anywhere like KMart or department stores, this is no longer possible. All they sell is mostly flimsy, weak junk. So it really depends on your budget. 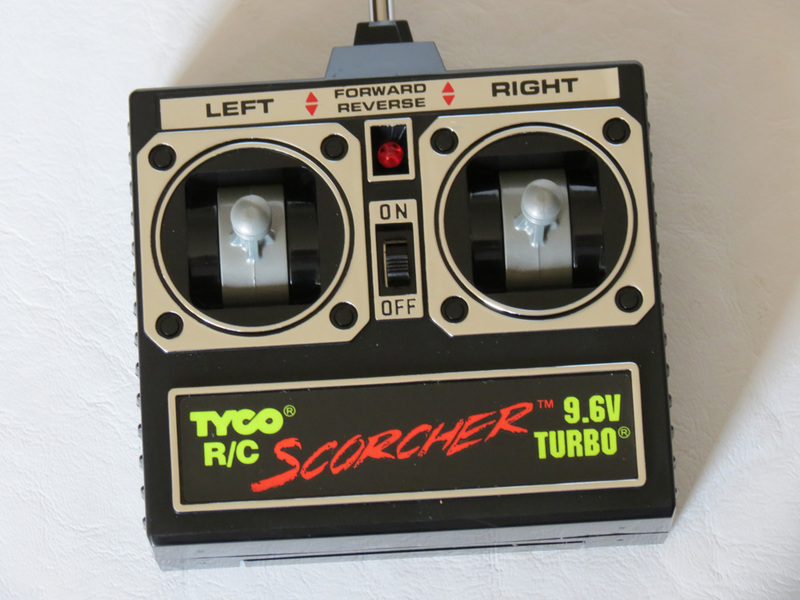 Back in the 80s/90s, something like a Taiyo/Tyco Scorcher would have been about AU$100. In today’s money that might have been more like $200 worth. So for $200, I would try to look at perhaps something “expert built” (ready to run) from Tamiya. Tamiya is the only manufacturer left now that doesn’t manufacture in China (all Tamiya is still made in Japan or Phillippines). 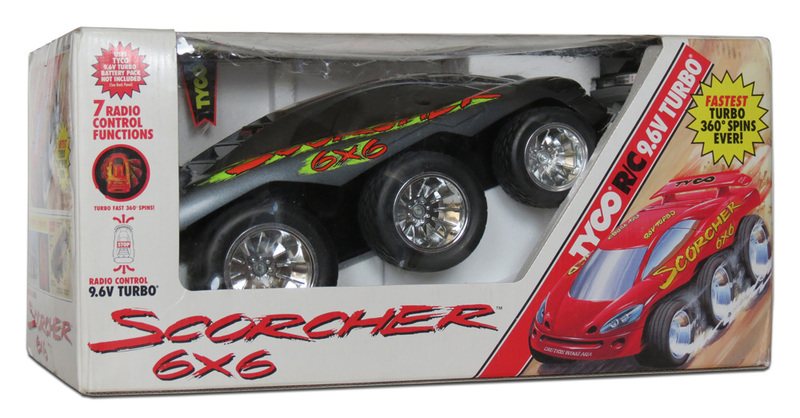 A few years ago, Tamiya also had a line of 1/16 ready to run cars called Tamtech Gear, and there were some buggies among them. Now discontinued, they were beautifully made and packaged. The only one I still see on eBay is the Tamtech Gear Wild Boar, at the $300 mark. But they originally made mini versions of their classics like the Frog, Hornet etc. 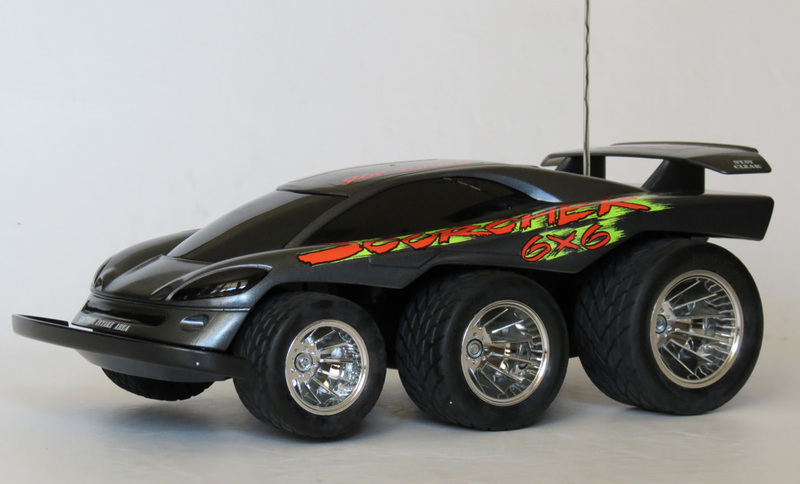 Kyosho makes a ready to run, all inclusive buggy called the Kyosho Nexxt at around $240. Made in china I think, but Kyosho (one of the great, original Japanese makers) have tried to maintain quality to a reasonable degree. Their future is now in doubt, having fallen into venture capitalist hands. Another old company still surviving, is the German company Carrera. They make everything in China these days. But occasionally put out a decent buggy or two, made with plastics and rubbers somewhat in the vein of the 80s Nikko/Taiyo models we all remember. I can’t vouch for a specific model other than the Dune Jumper from a few years ago, which is now discontinued, but was quite impressive when I picked one up. Expect to pay $100-$200 for something ok, but try to check their products out in person first, as they cater from the low end (rubbish) to the decent mid level ($200). My son came home from a neighbour’s garage sale a few months back with an old Scorcher. Pretty well used and unfortunately without a radio, so it’s reduced to being pushed around the house. Still looks pretty cool though. I think he entertained the notion that I would be able to get it going. Alas, no.